Back in January I pulled the trigger on yet another book idea. I loved the work Mark Horvath was doing to help the homeless. I hated that Mark was nearly homeless himself (again), living in a cockroach apartment with nothing in his fridge but a discounted vegetable tray and a bottle of water. He was eating his meals at the homeless shelter. It was stupid (and it still is). Somebody should be supporting Mark and making sure he can do this work without working himself to death. But nobody had stepped up. So I did. I couldn’t do much, but I figured I could put together a project that produces something people might be willing to buy, and we could give the money to Mark. So that’s what we did. I got a whole bunch of Mark’s friends to contribute—people like Trust Agent author Chris Brogan, mom blogger Jessica Gottlieb and Ford’s social media guru Scott Monty (and 21 others). We wrote up stories of homeless people from Mark’s travels across the country, telling the stories of moms and their kids, people who had been homeless for days and 0thers for decades, people from Seattle and Florida. The result is a manual to motivate action. It drips with Mark’s attitude and passion, the way he used what little resources he had, plugged them into social media and turned this thing into a real movement. I hope you’ll check it out. It would mean a lot to me and it would support Mark. Digital versions for the Kindle or other platforms for $3.99. Then tell your friends to buy it, review it on Amazon, like it on Facebook, whatever you can do. I need your help. Mark needs your help. The homeless out there need your help. Thanks. 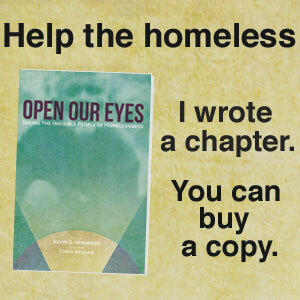 Remember that all profits go to homeless advocate Mark Horvath and his nonprofit InvisiblePeople.tv.